max steel wrote: The destroyer may be armed with up to 60 anti-ship cruise missiles, 128 anti-aircraft guided missiles, and 16 anti-ship guided missiles.The vessel may reach a speed of 30 knots and operate to up to 90 days without support. ST. PETERSBURG (Sputnik) — The Russian Navy unveiled Lider's designs at the Army-2015 international military technical forum earlier this week. So 60 UKSK, 128 Redut and 16 Uran? Uran can launch from the UKSK cells no? Perhaps 16 Hermes, although goodness knows what for. Uran can? I thought they can only launch from their dedicated diagonal launchers like Harpoon vs Mk. 41, if Uran can fit in UKSK then can it fit in a quadpack? Also what if Zirkon can't fit in UKSK so it needs a separate silo? Zirkon will almost certainly fit...after all it is designed to be able to be fired from UKSK. Uran could but that doesn't mean it will. I would guess it is supposed to be 64 Anti ship cruise missiles (ie 8 X 8 UKSK launchers) plus 128 SAM launchers in vertical tubes (4 X 32) and 2 x 8 UKSK with anti Sub weapons loaded... ie 16 Club anti sub missiles. Launching Uran from a UKSK tube would be like launching an SA-13 from an SA-12 tube. Another way would be instead of 16 anti-ship guided missiles it's actually 16 anti-sub guided missiles. They did have some rumours of Gorshkov carrying Medvedka-2 VLS, probaby Leader carries it? UKSK can carry the 91RE2 ballistic torpedo carrying rocket... that would make Medvedka redundant. chicken wrote: Another way would be instead of 16 anti-ship guided missiles it's actually 16 anti-sub guided missiles. They did have some rumours of Gorshkov carrying Medvedka-2 VLS, probaby Leader carries it? ST. PETERSBURG, July 2. /TASS/. The nuclear power generating facility for the propulsion system of Russia’s future aircraft carrier will be worked out on the Lider (Leader) class destroyer, a shipbuilding industry source told TASS on Thursday. "At first, the nuclear power unit for the future national aircraft carrier will be worked out on the Lider destroyer," he said at the International Maritime Defence Show (IMDS-2015). Elements of the ship’s deck, according to the source, will be worked out at the Yeisk training complex in the Krasnodar region in southern Russia. "Later, the future aircraft carrier’s body will be explored," the source added. As for the Leader destroyer, its construction could begin in 2019 - such statement was made by Commander-in-Chief of the Russian Navy Admiral Viktor Chirkov in late June. According to previous reports, this ship’s displacement may be 15,000 tonnes, the vessel will be armed with the Kalibr and Onyx cruise missiles or their modifications, as well as with the S-500 marine anti-aircraft missile system. The source told TASS that the Navy planned to get 12 destroyers of the new class. The 7th International Maritime Defence Show is held St. Petersburg from July 1 to 5, 2015. The IMDS-2015 organiser is the Russian Ministry of Industry and Trade. The exhibition is held with participation of the Russian Defence Ministry, Foreign Ministry, Federal Service for Military-Technical Cooperation, the Government of St. Petersburg and OJSC Rosoboronexport arms exporting company. The Exhibition Operator is Morskoy Salon JSC. Kalibr and Onyx cruise missiles or their modifications, as well as with the S-500 marine anti-aircraft missile system . ST. PETERSBURG, July 3. /TASS/. Basic design of the future Lider (Leader) class destroyer will be presented to the Navy in two versions in the first quarter of 2016, director of the state defence order department of Russia’s United Shipbuilding Corporation (USC) Anatoly Shlemov told TASS on Friday. "A contract on the Lider basic design development in two versions - nuclear and non-nuclear was concluded with the Severnoye (Northern) Design Bureau today. Under the contract the Bureau will complete the development of the multi-variant basic design and submit it to the Navy Chief Command in the first quarter of 2016. The Navy will make a decision and then the full-fledged development of the engineering design and work design documents will be started," he said. Shlemov said that the final variant of the new-generation ship’s propulsion equipment and its other characteristics have not been finally determined. "The Defence Ministry’s technical development plan specifies the development of two variants, and the Severnoye Design Bureau is working on both of them," he said. The construction of the head Lider destroyer could begin in late 2018, and its creation will take 5 - 6 years, he added. "We are completing the basic design, then we’ll proceed to the engineering design development during a year, and then develop the design documentation. According to our estimates, on the condition of the project’s promotion by the Russian Defence Ministry, it will be possible to start the ship’s building in late 2018 - early 2019. It will be a very serious ship. I think that the ship’s construction would take 5 - 6 years," Shlemov said. According to Shlemov, the St. Petersburg-based Severnaya Verf (Northern Wharf) shipyard could take up the destroyer building. "The plant is being prepared, the funds invested in the development will make it possible to implement this complex project, making a ship in any configuration - both nuclear-powered and non-nuclear," the expert said. A military-industrial complex source said previously that a nuclear-powered version was selected for the Lider class destroyer. No credible source. Nothing is even decided yet. It will certainly NOT look like that anime style scale model. So any info on if its going to be purely conventional propulsion, nuclear or half of them nuclear and half conventional as some people mentoined? 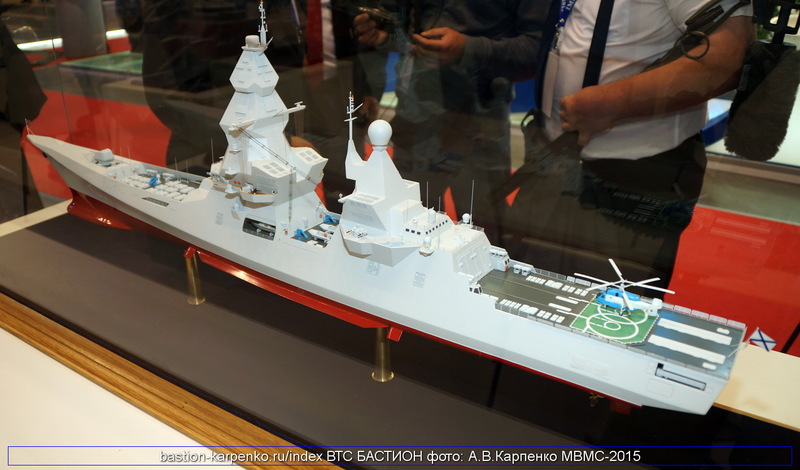 In the near future, the Russian Navy may receive a large and powerful destroyer. The main objective of such a vessel will be to create an "umbrella" above the sea. The project of the Russian destroyer is known as the "Leader" (Project 23560). According to experts' estimates, it will be the largest, most expensive and state-of-the-art Russian vessel since 1989. During the times of WWI and WWII, destroyers were not used to attack enemy fleet. Destroyers proved to be universal vessels instead. As soon as radars and missiles appeared, destroyer vessels were the first to carry them on board. Soviet destroyers turned into large antisubmarine ships, whereas US destroyers were the ships with guided missiles on board. The US destroyer Zumwalt, in the course of the evolution of these ships, has surpassed in size even the battleships of the Russian-Japanese War and became one of the largest warships of its class. It was Russia's Peter the Great missile cruiser could come near the US ship. In the foreseeable future, the Russian Navy may receive a strong and large destroyer. What kind of a ship will it be? As experience shows, the displacement of the ship that carries modern means of detection and fire control (high power radars with antenna 10 meters in diameter), as well as ammunition of dozens of long-range anti-aircraft missiles, should be at least 7-8 thousand tons. Such a vessel should have high masts. The higher the masts, the easier it is for radars to intercept enemy missiles, especially those flying at low altitudes. If such a ship also carries anti-aircraft missiles, cruise missiles and anti-submarine torpedo tubes, a helicopter and artillery, the displacement will increase considerably. The engine has to be nuclear in this case, and Russia has an extensive experience in building fine engines for ice breakers. It just so happens that the displacement of the new Russian vessel will be about 18,000 tons. This will make the ship comparable to the Dreadnought of Britain from 1906! In a nutshell, it will be the biggest, most expensive and modern Russian ship since 1989. Fleets of the world have obtained a multitude of large and well-equipped vessels since that time. Now it is Russia's turn to build a 18,000-ton nuclear-powered vessel. Clearly, there is no data on the basic parameters of the would-be ship. However, it was said that the ship will have a 50-meter high "pyramidal mast." The mast will enable the ship to detect low-flying objects at a distance of 20 nautical miles at sea level. The second, lower mainmast, will house communication systems. The design of the ship includes the reduced radar visibility technology. Missiles are launched vertically and can even turn where necessary. There will also be two chimneys on the ship. This suggests that the ship will be equipped with gas turbine engines that will be powered with conventional fuel. The vessel itself will be a nuclear-powered vessel. A nuclear reactor ensures an unlimited cruising range and does not need thousands of tons of liquid fuel. However, a nuclear engines has its disadvantages.They include a large size of the carrier vessel, as well as expensive and complicated maintenance. To crown it all, the ship will not be able to enter the Black Sea, because nuclear-powered vessels are not allowed to navigate there. There are other ports that a nuclear-powered ship will not be able to enter, but the entire project still has a lot more pluses than minuses. A nuclear engine is a "sea of ​​energy". A modern ship always needs energy, especially if it is going to carry a railgun - a weapon that fires projectiles with the power of electromagnetic field. In addition, the ship will need the power for 3-D printers that will appear on board combat vessels in the near future. The printers will be used to produce plastic drones for reconnaissance activities far away from the ship. At any rate, the model of the Russian Leader already exists. We can only wait for the time when the new ship is born. As of now the Pagoda Leader design is one of the proposed designs in competition, the final design may be different, nothing is set in stone as of yet. With a vessel like a Frigate it will need a decent structure but lots of angles like that pagoda design seems a lot of complication for very little real return. A tall structure that is fairly broad would allow lots of internal volume for large radar arrays and sensors, but I suspect they will emphasise flush antennas built in to the structure to reduce their effect on RCS.